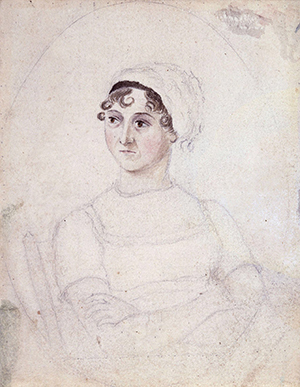 Portrait of Jane Austen, (c. 1810) by her sister, Cassandra. In a famous scene in Northanger Abbey, Catherine Morland confesses to Henry Tilney that she rarely reads history, finding it ‘tiresome’. ‘I read it a little as a duty’, she admits, ‘but it tells me nothing that does not either vex or weary me. The quarrels of popes and kings, with wars or pestilences, in every page; the men all so good for nothing, and hardly any women at all’. Catherine’s frustration evokes a literary-historical landscape from which women are missing, and this ‘absent woman’ of course becomes the centre of the comic gothic plot of the novel. But while Catherine laments this absence, her conversation with Eleanor and Henry shows us something rather different. Catherine seems part of a lively culture of literary conversation in the last decades of the eighteenth century: she discusses her reading preferences; debates the value and gendered readership of novels (mentioning the very popular novelist Ann Radcliffe by name); and is even able to tantalize the more sophisticated Tilneys with a piece of literary gossip out of London. This talk explores literary landscapes for women in Britain in the late eighteenth century. Were they absent or present? How did they participate? Were they predominantly readers (like Catherine) and rarely writers (like Radcliffe or Austen herself), or more closely involved? And how might this milieu have influenced Austen’s own trajectory as a writer in provincial England? Dr Katrina O’Loughlin holds an Australia Research Council Discovery Early Career Research Award (DECRA) based at The University of Western Australia. She is a literary and cultural historian with research interests in eighteenth-century writing, travel and intellectual exchange, particularly among women. She has published on various aspects of Enlightenment and Romantic literature, and her monograph Women’s Travel Writing of the Eighteenth Century: ‘The Paper Globe’ is in press with Cambridge University Press. Her current project investigates manuscript culture and friendship across Europe between 1760 and the 1830s. On the two-hundredth anniversary of her death, this UWA Institute of Advanced Studies - Centre for Medieval and Early Modern Studies Lecture Series presents new perspectives on the life and work of Jane Austen. Drawing upon the latest literary and historical research, UWA researchers tackle key themes in Austen’s work and the wider social and cultural contexts in which she created her now world-famous novels.